Japanese Anime’s presence in western cartoons has been prevalent for years, exemplified in the drawing and animation style in shows such as Teen Titans and Avatar: The Last Airbender. But in recent years, a number of American-looking cartoons utilizing anime-like elements have come into the foreground of popularity. Rather than discussing anime’s influence on Western media through the anime-looking western cartoons of the early 2000’s, I will be discussing these recent “hybridized” cartoons to exhibit Japan’s influence on America. Before introducing the anime influenced American cartoons, it is important to establish definitions for anime and American cartoons. Anime, from a western perspective, is linked to aesthetically pleasing details that are not present in American cartoons, be it in music, art style, or animation. As one interviewer notes on perceived anime style, “Anime focuses a lot on the eyes,” which is seen as unique to American audiences. But this attention to detail expands beyond the eyes in anime. Take the transformation sequence from Sailor Moon: The character is designed as an attractive young woman with detailed, “shiny” eyes; the animation pans over the girl’s body from various angles, with flowing animation from the hair and skirt; the cooing background music accentuates the excitement and beauty of the transformation, but does not interact with the cartoon beyond adding mood. All of these elements in music and animation are not typically present in American cartoons—possibly because the features, while attractive, do not provide any real content to the episode. On the other hand, American cartoons focus on simple function in exchange for detail. The function-based nature of American cartoons can be seen in The Fairly OddParents: the characters are designed in a simple—yet functional—cartoon style rather than modeled after more realistic human anatomy; animations consist of the necessities including speaking animations and animations when picking up/using objects; and the music occurs only when something relevant in the scene occurs (for instance, a flourish when a scene begins, or brief celebratory music for positive occurrences). Thus, each element has its purpose in moving the episode’s plot along. Put simply, anime tends to focus on aesthetically attractive details regardless of purpose, while American cartoons favor functional simplicity in exchange for detail. Hybridization occurs when a cartoon—in this case, an American cartoon—is able to execute both American cartoon features (simplicity and functionality) and anime features (aesthetic detail) simultaneously. While there are a number of recent hybrid cartoons, I will use Steven Universe to exemplify hybridization. Steven Universe, created by Rebecca Sugar, is a sci-fi mixed with slice of life cartoon starring Steve, a half-magical half-human boy, and his female alien companions Pearl, Amethyst, and Garnet. Together, these characters are known as “The Crystal Gems.” The influence in the show taken from anime is evident: the creator claims that she is a fan of many anime series and often makes references to outside anime and cartoons, but aims to use these elements to “make something really new.”  Sugar’s account of anime influence differs from how older creators account for the anime influence in their cartoons. For instance, the creators of Avatar: The Last Airbender explicitly reference Japan inspiration, stating that their “love for Japanese Anime… [and] Eastern philosophies led to the initial inspiration for Avatar.”  In this way, Steven Universe can be set apart from explicitly anime-like western creations. While Steven Universe uses anime elements, is not meant to make explicit its anime elements—rather, it is indeed a true hybrid, leaning closer toward neither anime nor American cartoon. One of the major ways in which Steven Universe exhibits its hybrid identity is through the detail in character design. Characters are fairly diverse in general shape; character outfits each have their own individual style (delicate for Pearl, rebellious for Amethyst, etc. ); and the designs incorporate certain “moe elements” usually associated with anime, such as purple or spiked hair. But despite this detail, the designs still retain a certain simplicity to them reminiscent of American-style cartoons—namely in the simplicity of the character eyes, and utilization of simple shapes to create the characters rather than modeling directly off of human anatomy. Using these hybrid characters, Steven Universe is able to execute aesthetic-driven scenes without awkwardness, while also smoothly presenting more American style narratives. This utilization of both spheres is exemplified in the episode “Steven the Sword Fighter.” The episode’s beginning contains comedic American-style banter between Steven and the Crystal Gems, lacking background music and serving the purpose of introducing the topic of the episode. 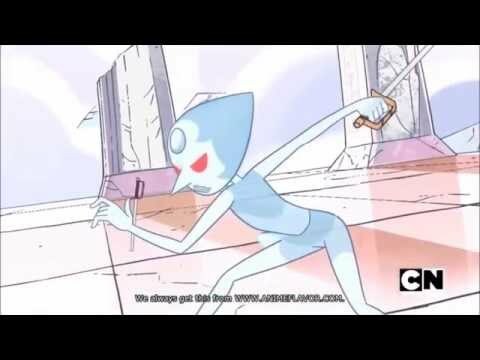 Subsequently, the episode features a swordfight between Pearl and “Holo-Pearl” (a clone hologram of Pearl). The battle exhibits various camera angles and complex fighting animations, backed by delicate piano and synth music to frame the mood. The battle scene would be difficult to picture with more traditional American characters such as Timmy Turner, while the comedic banter earlier in the episode would be equally peculiar with anime-style characters. But through the hybridization of the series characters, Steven Universe is able to perform both anime-style and American cartoon-style scenes and features. Hybridizations illustrates the way an essence of J-cool has penetrated American popular culture: individuals can consume J-cool features even without direct exposure to Japanese material. An American cartoon fan cannot consume anime features watching, say, The Fairly OddParents; further, such a fan cannot consume anime features directly from watching anime, as anime would be outside of their scope of consumable material. Yet if the American cartoon fan watches a hybrid cartoon such as Steven Universe, he can indirectly consume anime features present in the show. Furthermore, the detailed anime elements such as camera angles and background music can be consumed by the fan, and subsequently perceived as regular for American cartoons. The normalization of J-cool aspects in American media through hybrid cartoons suggests that J-cool elements have potential to become integral aspects of American pop culture. Thus, these new cartoons provide evidence of the increasing pop culture power Japan harbors over the west. 1. What is the relationship between early 2000’s anime-like American cartoons and J-cool’s presence in America? Do they differ significantly from hybrid cartoons? 2. The existence of anime-looking American cartoons such as Avatar: The Last Airbender illustrate that Anime has had a presence in American animation more than decade a go. Why is the hybridization of Anime and American cartoons occurring now, rather than earlier? 3. Steven Universe is a hybrid cartoon created in America. Can hybrid cartoons be created in Japan? If so, how? In what ways would Japanese hybrid cartoons differ from American hybrid cartoons? “Bee and PuppyCat Creator Natasha Allegri Is Very…” Interview by Frederator Times. Frederator Times. N.p., 14 Nov. 2014. Web. <http://times.frederator.com/post/101804267445/bee-and-puppycat-creator-natasha-allegri-is-very>. “Our Interview With the Cast and Creator of Cartoon Network’s Steven Universe!” Interview by Susana Polo. The Mary Sue. Dan Abrams, 15 Oct. 2014. Web. <http://www.themarysue.com/steven-universe-interview/>. “AVATAR’S BRYAN KONIETZKO AND MICHAEL DANTE DIMARTINO.” Interview by EDUARDO VASCONCELLOS. ING. Ziff Davis, 6 Sept. 2007. Web. <http://www.ign.com/articles/2007/09/06/interview-avatars-bryan-konietzko-and-michael-dante-dimartino>. 4. Sugar, Rebecca. “Steven the Sword Fighter.” Steven Universe. Cartoon Network. 19 Apr. 2014. Television. 5. Hartman, Butch. “Hail to the Chief.” The Fairly OddParents. Nickelodeon. 27 Sept. 2002. Television. 6. Satou, Junichi, Kunihiko Ikuhara, and Takuya Igarashi, dirs. Sailor Moon. TV Asahi. 1992. Television. 7. DiMartino, Michael D., and Bryan Konietzko. Avatar: The Last Airbender. Nickelodeon. 2005. Television. Greetings, I’m Lexie Lucero-Carter. Sophomore at The College of William and Mary. Linguistics major. Japanese minor. I’ve been studying the Japanese language since my freshman year of high school, and have been more or less aware of Japan through means of anime, manga, and video games since elementary school. Since attending college, I’ve taken several Japanese language courses, a course on Japanese monster mythology, and a course on Japanese modern/contemporary literature. As these courses have given me new background on Japan that I couldn’t receive through Japanese pop-fiction alone, I hope to take more in the rest of my years at the college. I enjoy drawing, and have been (unsurprisingly) influenced by various anime and manga styles. I like learning things about comics as a means of storytelling.